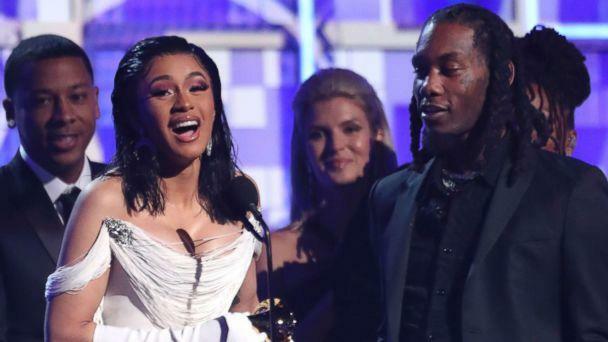 Women had a big night at the 2019 Grammy Awards.After the #GrammysSoMale hashtag trended during the 2018 award show, with only one female singer, Alessia Cara, accepting an award during the broadcast, all eyes were on this year's show to see how females in the music industry would fare. And Sunday night did not disappoint. Host Alicia Keys, the first woman to host the Grammys in 14 years, delivered a female-centric opening speech, bringing out Michelle Obama, Lady Gaga, Jennifer Lopez and Jada Pinkett Smith. Lady Gaga took home 3 Grammy awards: best pop solo performance for "Joanne," and best song written for visual media and best pop duo performance for "Shallow." Country Singer Kacey Musgraves had a strong night as well. Her "Golden Hour” album won best country album and the highly coveted album of the year award, an impressive feat with popular artists like Drake, Brandi Carlile, Post Malone and Kendrick Lamar also nominated in the category. She also received the best country solo performance award for "Butterflies" and best country song for "Space Cowboy." Another big category, best new artist, went to a female artist, English singer Dua Lipa. During her acceptance speech, she expressed her excitment to be in such notable company. "I just wanted to say how honored I am to be nominated alongside so many incredible female artists this year, because I guess this year we really stepped up!" she said. Some took this as a subtle reference to a comment Neil Portnow, president of The Recording Academy, made to Variety in 2018 when asked about the lack of gender diversity in last year's show. "It has to begin with… women who have the creativity in their hearts and souls, who want to be musicians, who want to be engineers, producers, and want to be part of the industry on the executive level… [They need] to step up because I think they would be welcome," he told the outlet. When asked about about her acceptance speech during a post-award presser, Lipa shared, "First of all being in the new artist category and having so many female artists nominated is a big change. And it's the change that we hope to see for many years to come." "It’s a big difference from the previous years," she continued. "To see so many women honored, I was like 'this is amazing.' It only felt right to be able to do that." Lipa also won best dance recording with Silk City, the musical group composed of Diplo and Mark Ronson, for "Electricity." Cardi B also pulled off a historic win. She became the first solo woman to win best rap album for "Invasion Of Privacy." Best R&B performance and best R&B album went to newcomer H.E.R., who also performed during the show. Along with big female wins, most of the night's performances were by female artists. Host Keys delivered an incredible medley of songs like "Killing Me Softly With His Song," "Unforgettable," "In My Feelings," "Boo'd Up" and "Lucid Dreams" among other hits. Cardi B, Janelle Monae, Brandi Carlile, Kacey Musgraves and Lady Gaga all delivered solo performances. Kacey Musgraves, Katy Perry, Miley Cyrus, Maren Morris and Little Big Town came together for a moving tribute to Dolly Parton, led by the queen of country music herself. Although many felt this year's show was a step in the right direction, it's evident that there is still a dire need for an increase in female representation and diversity in the industry. A study of females in the music industry, "Inclusion in the Recording Studio?” by Stacy L. Smith and the USC Annenberg Inclusion Initiative, released last week, found that females accounted for 10.4 percent of Grammy nominees from 2013-2019 while 89.6 percent were male. This data was drawn from the 1,064 people nominated in 5 categories from 2013 to 2019. Women of color accounted for 36.9% of nominations during the time span. The study also points out that a woman, Linda Perry, was nominated for producer of the year, non-classical, a category in which females representation is severely lacking. "We need to show 13-year-old girls: Being an engineer is cool. Actually you have more power on this side. These are really powerful positions to be in," she told Rolling Stone in December. "There’s other places women can have their voice be heard," she continued. "We’re developing community and giving people the right information. There are women in these positions, but we’re not focused on it enough. This nomination is a win for all women producers and engineers." She lost to Pharrell Williams last night.